A child separated forever from family and friends and shipped off to another country to serve as child labour? Couldn’t be part of Canadian history, could it? A small exhibit – a powerful story! The Fabric of British Home Children at the Galt until 30 January 2011. Poor, alone, unwanted and vulnerable is how many British children must have felt in the crowded cities of Britain during the middle of the 19th century. The cities at the time were places of poverty, pollution, social inequality, slums, and dangerous working conditions for hundreds of thousands of people. With the rising population and increased urbanization, some church groups, orphanages and workhouses felt they could no longer support the growing number of children in their care. The solution? Send them off to the colonies to work on farms or as domestic help. Between 1869 and 1948, Britain sent approximately 100,000 children to Canada. The move sometimes split up families – some of the children were orphans, many (perhaps as many as 2/3) were taken from their parents; sometimes siblings got to remain together, sometimes they were sent to opposite ends of Canada. The idea was to have the younger children adopted by the families in Canada while the older children were to be provided with food and shelter in exchange for labour. How did it really work? It depended on the family that took them in. Some children thrived in their new country. The lucky ones were taken in and adopted by loving, caring families. Other children faced abuse, loneliness and poor working conditions, working as free labour without benefit of education or support. This is a story of many Canadian families. It is estimated that 4,000,000 Canadians today – or more than 10% of our population – can trace part of their family history to the British Home Children. Over 10,000 of the British Home Children fought in the First and Second World Wars. Starting with so very little, these children grew up to be many of the men and women who helped to build Canada. But many of the home children didn’t tell their families of their experiences. So families often had to research and find out the stories for themselves. A woman’s wish to know more about her family and to honour the British Home Children lead to this exhibit. The exhibit is focused on two quilts created by Hazel Perrier of Claresholm, Alberta, to commemorate the British Home Children. One quilt is made from squares sent to Hazel from descendants of British Home Children from across Canada. The other quilt tells Hazel’s own family history. Bobbie Fox, a Galt staff member, researched and wrote panels on the history of British Home Children to provide more context for the quilts during their stay here at the Galt. It is particularly appropriate that this exhibit is here this year as 2010 has been declared by the House of Commons as the Year of the British Home Child. Member of Parliament Phil McColeman had an uncle who was a Home Child and MP McColeman successfully introduced a private members’ motion that was unanimously passed in the House of Commons last year. 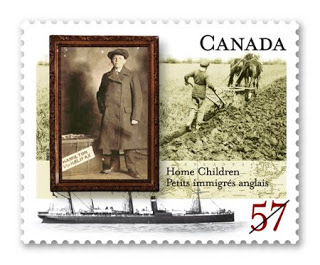 In honour of the Year of the British Home Child, Canada Post issued a commemorative stamp. You can learn more about the message in the stamp when visiting the exhibit. Web-sites and organizations are working with families to help them trace them origin and ancestors. It is impossible to give these children back their childhoods – but hopefully many of the families will be able to find their history and learn the true story of their families. From what I have seen with families and visitors, the great power of this exhibit is its ability to start conversations and to start people thinking about these issues, these lives and how the individuals and Canada were all affected. I don’t have answers for the questions I pose below but these are some things I’ve asked students to consider: Was life in Canada better than in the slums, as the reformers of the time believed, or worse? Should Canada follow other countries and apologize for this program? Is this still happening (in a slightly different way) in the world today? What can or should be done about it? If you have answers or just want to discuss the questions above, take some time this fall to stop by the Galt, view the exhibit and think about the British Home Children.